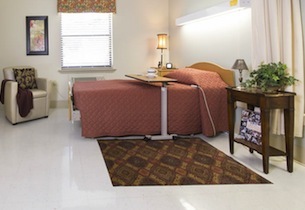 Perry County Nursing & Rehabilitation Center received its latest renovation in 2008. This renovation allowed for additional garden areas to be added to landscaping of our beautiful grounds. This renovation also allowed for an observation unit to be added. The tranquility of the woods surrounding the center adds to our country charm. Deer, squirrel and many birds are frequently seen grazing around the facility. 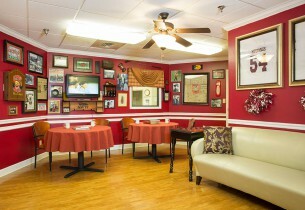 As you walk in our front door you automatically feel at home. Our home like atmosphere is hopefully different than any other facility you may visit. Our spacious dining area, allows for a comfortable setting for meals, tea parties for our ladies or other events as needed. Our man cave gives our gentlemen an area for small talk, games, and provides them with a separate area to watch their ball game of choice. 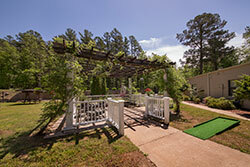 Our covered patio area also allows our residents to enjoy fresh air and watch the wildlife. 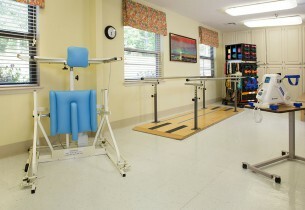 At PCNC we strive to keep our residents involved and as independent as possible. Resident excursions are planned throughout each year. Outings differ each year based on the interest of our residents. Trips to Oak-lawn, Petit Jean State Park, and Mustang Football are just a few of the recent trips..